If you are training for the Houston Marathon or Houston Half-Marathon, you are beginning to hit those extra-long runs, just before the taper approaches. There are many runners who find the taper to be magical: a reduction of mileage to build up endurance as race day nears. Many also find that the taper solves those nagging aches and pains they’ve been feeling during training runs. Unfortunately, this isn’t usually the case. A runner’s most important piece of equipment is the feet. If the feet are in pain, it isn’t just cause an isolated problem. Foot pain disrupts your overall stability. Your body tends to move away from any source of pain, but when that pain is in your feet, it makes you more likely to have pain in your knees, hips, and back as a result of the unnatural pulling away from the ground. As a runner, this just compounds your problems and forces you to take time away from training. For some reason, many runners think that foot pain will go away in time. They may take some time off of training, but most will likely keep running, all the while assuming their pain will magically resolve. The trouble with foot and ankle pain is that, even if one takes a break from running, the structures are still being used every time you walk. Sometimes the pain does resolve on its own. Usually, however, the problem persists and greatly affects your training. The Houston Marathon is now just under two months away. NOW is the time to check out any pain or problem. Too often runners wait until the last minute...right before a race...to get their injury evaluated. While we can sometimes salvage the training and move forward towards the race, too often the length of the injury’s treatment means you’ll have to miss your race. I routinely say that my LEAST favorite time to practice is the two weeks before the Houston marathon. That’s when I have to tell my patients, many of whom have been training since July for their first marathon, that they’ll have to cancel their race and postpone their goal. Don’t let that be you!! 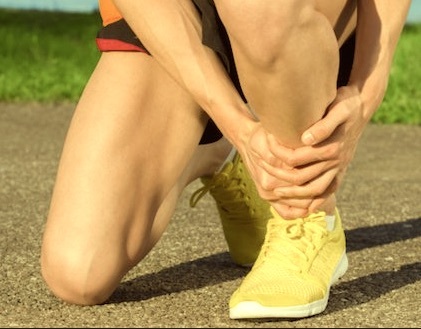 If you have been experiencing any lower extremity pain that has persisted for more than a week, even if it only occurs when you run, be sure to get checked by a podiatrist. Go for what would hopefully be a quick fix now, rather than a major disappointment later on. Still feeling great but want to make sure your training is on the right track? The key to staying pain-free is to make you sure you follow and stick to a safe plan. Typically, you'd want to give yourself at least three months to properly prepare your body to run 26.2 miles, but if you've only got 8 weeks left: never fear! It's not too late to get ready safely! Here's a link to a well-thought out training schedule from Running Competitor magazine. You'll note the tapered runs at the end of the schedule, and the all-important inclusion of cross training and rest days. Here's wishing you good luck and good health in the short time remaining before the Houston marathon. And just remember, if anything starts to hurt, even if the pain goes away after you stop running, come see me right away. In the time we have left, I should be able to ensure you can compete in the Houston marathon, even if you have to alter your training and overall time goals.